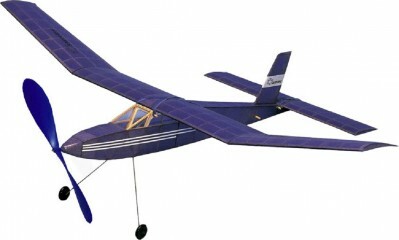 If you're into high performance, duration, rubber powered models, the West Wings Sapphire is for you. Styled with a blend of classic and modern lines the Sapphire extracts amazing performance from it's 825mm (32.5") span. Construction is from the conventional formers and strip built over the plan. All formers and ribs require cutting out from pre-printed balsa sheets, but this is half the fun! The strength comes from the tissue covering, which is actually easier to do than you'd think. Alternatively, you can use one of the latest, super-lightweight, heat shrink coverings if you are familiar with them. Care should be taken not to distort the lightweight structure with this method.